The Two of Pentacles (R) indicates that you are adaptable, easy-going with friends and associates and this makes you vulnerable to the influence of individuals or mass opinion. When you feel life is pushing you around and you don’t know where you are going – look around for the deeper meaning to your experience. Note any similarities to past events – then compare them, so that you will have the vision to find a new direction. You have become overly passive to the point of inactivity. Waiting and watching – afraid to jump into the heat and passion of life and now, the game of life has become forced. Is your disorganization is causing the difficulty? Consider a completely new approach. Faced with some problem or social pressure, you have chosen not to make a fuss – pretending to yourself and others by taking everything “lightly”. Things will always straighten themselves out. You may receive discouraging news – but you should keep trying. This is not a time of disappointment, but a time of expansion. Balanced changes in your relationships and work that can re – balance your life experiences. Positive change that is stable, solid and secure. Difficulties with physical choices or competitive situations. Enjoining the battle, as opposed to seeking a solution. Confrontation replaces competition. Your winning requires someone else to loose or visa versa. Physical importance, a lack of means, of choice in the matter. Too good a neighbor on one extreme or not at all a good neighbor on the other. What two or more situations are you handling with ease? What do you want to change in your home, profession, status, finances? What are you juggling in order to keep stable – money, weight, finances, lifestyle? In what ways do you play and use your excess energies? 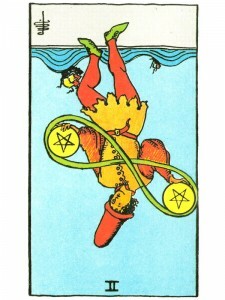 Next to Hanged Man: You must wait for the situation to materialize – don’t be so impatient. Next to Ace of Swords: Re-evaluate new ideas – eliminate unnecessary spending – your budget must balance now. Five before or after: You are scattering your energies and this is causing confusion – if you have lost something, it will be found once you settle down. In the first position: On one extreme, you could be fanatical in areas fostering the affairs of your physical/material plane, generating problems. Or, you could be remiss about establishing and promoting yourself up to your potential and generate difficulties of an entirely different kind. In the second position: Not realizing your capacity to manage time/materials and keep many balls in the air has weakened your position. Do not let doubt drain your momentum. Be decisive, act in a timely manner and do not wait for perfection. Each action can correct/improve the preceding. In the third position: Timing is the issue here. To move forward now will require an unnecessary struggle. Better to wait and review possibilities, work on preparations for confrontation as a contingency. Let time be your friend. In the fourth position: Desire here is to manipulate the Physical/material plane rather than to work with it to foster harmony. In the fifth position: You have not been able to generate or decide among options. Perhaps you do not want movement or merger or any additional contact at the moment, preferring the status quo. Or, you could have even generated a plan beyond your expectations or needs which is assuming a life of its own. In the sixth position: Effect on the emotions of ignoring physical/material alternatives. Sluggishness in any of the Physical Plane activities has a direct cause/effect relationship with the Emotional Plane. You cannot be successful in your relationships or creative work without healthy movement, progress physically. In the seventh position: Fear of the opposition, of the physically different, of taking the next physical step, of changing routine. At the extreme, this will be an unwillingness to change anything of consequence in your physical plane. In the eighth position: Vacillation, reversal, disorganization. Any or all of these may mark the present or near future situation. The present situation is not productive. In the ninth position: The attempt to achieve growth emotionally through something that is predominantly physical is producing some discomfort, even heartache here. Or, the heart is not enthusiastic about a physical/material option. In the tenth position: Use this rebirthing of your innate gifts to balance, to manage your affairs with subtlety for maximum effect in your environment.